The citizens of Shenkuu need Snorkles for the Lunar Festival celebration, but those wily Petpets have escaped! Orrin must hurry around collecting the Snorkles (plus some Festival goodies along the way) before the proceedings begin! 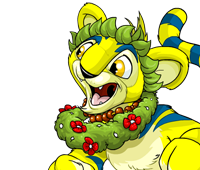 Watch out for items and other Petpets that aren't on your list. If you happen to pick one up, you'll have to give it to Anshu before continuing on. You are about to send feedback on Revel Roundup. We would appreciate it if you could give the game a rating out of 10, and also tell us any additional comments you may have. Thank you for your feedback on Revel Roundup.